Notorious Mexican druglord Joaquin "El Chapo" Guzman has been found guilty on all counts in his federal drug trial. Gus Rosendale reports. In the world of corrections, there are inmates who pose security risks, and then there's "El Chapo." Drug lord Joaquin Guzman has an unparalleled record of jailbreaks, having escaped two high-security Mexican prisons before his ultimate capture and extradition to the United States. 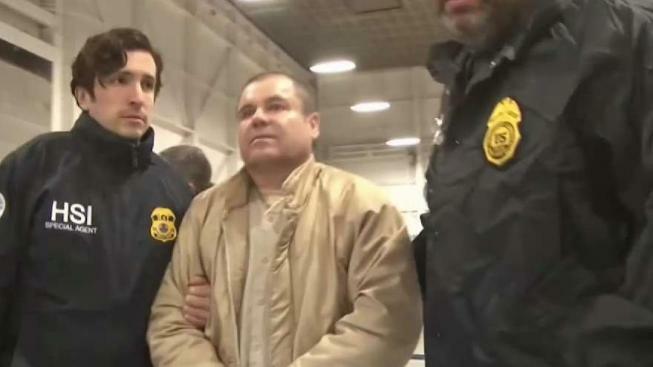 So with Guzman convicted Tuesday of drug trafficking and staring at an expected life sentence, where will the U.S. imprison a larger-than-life kingpin with a Houdini-like tendency to slip away? Experts say Guzman seems the ideal candidate for the federal government's "Supermax" prison in Florence, Colorado, also known as ADX for "administrative maximum," a facility so secure, so remote and so austere that it has been called the "Alcatraz of the Rockies." "El Chapo fits the bill perfectly," said Cameron Lindsay, a retired warden who ran three federal lockups, including the Metropolitan Detention Center in Brooklyn. "I'd be absolutely shocked if he's not sent to the ADX." Located outside an old mining town about two hours south of Denver, Supermax's hardened buildings house the nation's most violent offenders, with many of its 400 inmates held alone for 23 hours a day in 7-by-12-foot (2.1-by-3.7 meter) cells with fixed furnishings made of reinforced concrete. Unabomber Ted Kaczynski, Boston Marathon bomber Dzhokhar Tsarnaev, Sept. 11 conspirator Zacarias Moussaoui and Oklahoma City bombing accomplice Terry Nichols are among those who call it home. But Guzman, set to be sentenced in June for smuggling enormous amounts of narcotics into the U.S and having a hand in dozens of murders, would stand out even from Supermax's infamous roster because of his almost mythical reputation for breaking out. That includes a sensational 2015 escape from the maximum-security Altiplano prison in central Mexico, where he communicated with accomplices for weeks via cellphone, slipped into an escape hatch beneath his shower, hopped on the back of a waiting motorcycle and sped through a mile-long, hand-dug tunnel to freedom. 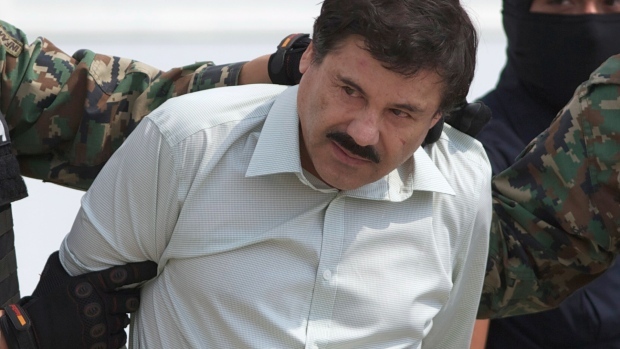 Bribery is widely believed to have enabled that jailbreak, as well as a 2001 escape in which Guzman was smuggled out of another top-security Mexican prison in a laundry basket. "There had to be collusion from within," said Mike Vigil, a former U.S. Drug Enforcement Administration agent who worked undercover in Mexico. "There is no doubt corruption played a role in both of his spectacular escapes." Could that happen at Supermax? Not likely. Prisoners at Supermax spend years in solitary confinement and often go days "with only a few words spoken to them," an Amnesty International report found. One former prisoner, in an interview with The Boston Globe, described the lockup as a "high-tech version of hell, designed to shut down all sensory perception." Most inmates at Supermax are given a television, but their only actual view of the outside world is a 4-inch window whose design prevents them from even determining where they are housed in the facility. Human interaction is minimal. Prisoners eat all meals in the solitude of their own cells, within feet of their toilets. The facility itself is guarded by razor-wire fences, gun towers, heavily armed patrols and attack dogs. "If ever there were an escape-proof prison, it's the facility at Florence," said Burl Cain, the former longtime warden of the maximum-security Louisiana State Penitentiary at Angola. "It's the prison of all prisons." While federal authorities have not said for certain where El Chapo will be housed, he's staring at "a sentence from which there is no escape and no return," U.S. Attorney Richard Donoghue said after Tuesday's verdict. Guzman's confinement leading up to his three-month trial included remarkable security measures reflecting his immense flight risk. He has been housed in solitary confinement in a high-security wing of the Metropolitan Correctional Center, a Manhattan lockup known as "Little Gitmo" that has held notorious terrorists and mobsters. Authorities have routinely shut down the Brooklyn Bridge to shuttle "El Chapo" to federal court in a police motorcade that includes a SWAT team and ambulance tracked by helicopters. Heavily armed federal officers and bomb-sniffing dogs have patrolled outside the federal courthouse in Brooklyn. Officials were so concerned about security, in fact, that Guzman was forbidden from hugging his wife at his trial. That apparently won't be a problem if he winds up in Supermax, where all visits are non-contact, and prisoners are separated from their visitors by a thick plexiglass screen. "Other than when being placed in restraints and escorted by guards, prisoners may spend years without touching another human being," the Amnesty International report found.